about a month before our anniversary is when we start in with all the talking. the let's-get-dressed-up-and-go-someplace-really-nice-for-dinner talking. the let's-really-do-this-thing-up-right talking. we go back and forth on the where and the when and we get all excited because surely it will happen this year. surely, one of us will pull it together. and then I think maybe he waits for me to plan it and okay, I sort of I wait for him to plan it and the whole time, we're talking about how epic it will be. both of us thinking the night will somehow magically pull itself together. and then it's the week of our anniversary and we are still just talking. we realize we do not have a plan. we do not have reservations, we do not have a babysitter. most importantly, we do not have a cute anniversary dress. this is also when we realize something else. we are big talkers. and so this is how we ended up at the coast last weekend for our 17th wedding anniversary. squirrelly kids and giant beach towels and tubes of sunscreen and a whole mess of plastic sand toys in tow. not exactly what we had in mind but this would not be the first time. not that the beach is even remotely any sort of punishment but you know. hello, sweaty sunburnt skin. hello, grouchy over-tired children. hello, sand in unwelcome places. again, not exactly what we'd originally had in mind. but real. and strangely perfect. so, mexican for dinner, saltwater taffy for dessert. kids playing in the sand while the sun set on the pacific ocean. and us. at the end of the day, us. and if that's how the anniversaries go down from here on out, I'll take it. in fact, it does sound perfect [minus the sand everywhere]. happy seventeen, hulas. This is the sweetest thing. Happy anniversary to you & the man! it's so nice to hear 17th anniversary. congrats and thanks for the inspiration. looks like a perfect way to celebrate. i think it sounds heavenly....i really do ! Congrats! I have a feeling that you guys could be anywhere, even a garbage heap (ok, maybe not the smell!). xo to you both on an amazing milestone! Happy Anniversary! Sounds like a perfectly wonderful weekend! Congratulations on 17 years!!! And your anniversary celebration sounds like a slice of heaven to me...Many, many more!!! happy anniversary! we had our 11th last week and stayed home with takeout and a movie. on our 10th last year we took our daughter out for dinner. it is what it is! seventeen years?! congratulations :) it sounds perfect. hey, i happen to really think it's true. sometimes the nights with no plans turn out to be some of the most memorable. cheers to you and your husband! congrats on 17! Well that's just how you roll. Glad my husband and I aren't the only ones who procrastinate on the anniversary plans! All in all it is a great way to celebrate, the family you created all together, sandy, chaotic perhaps, but happy to be together. Beautiful photo, it sounds like the perfect place to spend a 17th anniversary. happy anniversary lady! it's nice to go with the flow...plans can be oppressive. Happy Anniversary! The sand everywhere part was worth it for such a wonderful shot! A belated Happy Anniversary to you and your beau! 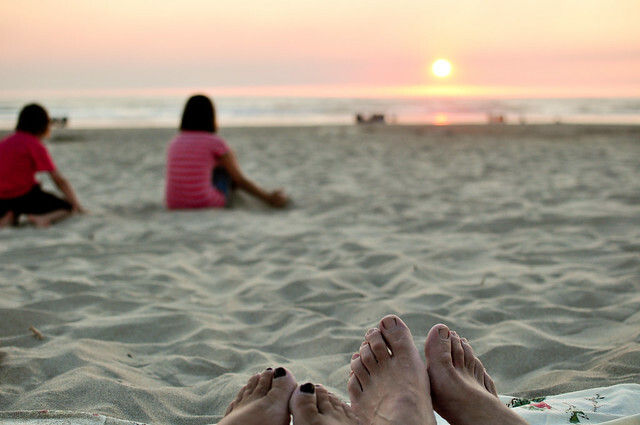 A family day at the beach sounds like a great way to celebrate with those who mean the most to you. beautiful. here's to 17 more (and more and more)! congrats on 17 years, that's totally awesome. love your take on planning... it sounds all too familiar. Happy anniversary Andrea! From the picture, I would say this must have been the perfect day..
My favorite picture of your anniversaries is the one you wrote about standing in front of the display of thousands of socks - trying to choose something for Ezra. Anniversaries are funny. Congratulations (late) on yours and Ward's! Happy 17th to the super duper Jenkins duo! Sounds like it was a wonderful day.